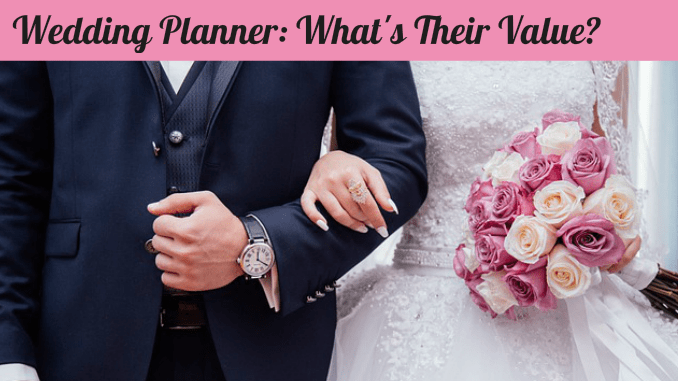 Wedding Planner: What’s Their Value? Why a wedding planner? 2.5 million reasons! That’s right, each year there are 2.5 million weddings coming off the production line. This suggests that the number of wedding events taking place in your locale is phenomenal. Of course, wedding trends show millennial brides are heavily influenced by the need for a wedding cordinator. If you desire every tiniest little detail to be cared for at your wedding, it’s suggested that you hire a wedding planning coordinator. Hiring a wedding planner can save you a lot of time and money. An event organizer will save you a lot of time, money, and most of all stress! You’ve heard the saying, “you don’t know what you don’t know”, right? A wedding planner has experience, knowledge, to create huge value! They’ll, Most certainly, bring you value way above their fees. So, you shouldn’t hesitate to hire one! What is a wedding planner anyway? A wedding planner (sometimes called a wedding coordinator, wedding director, or a wedding producer) works to aid couples in a wide variety of tasks related to their wedding celebration. At times the preparation of your wedding event can become overwhelming and steal your joy. 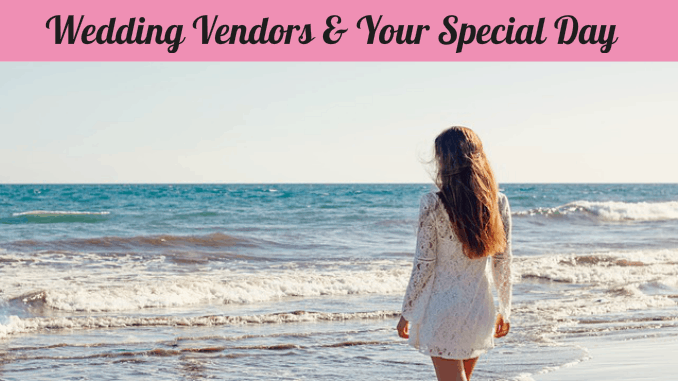 Avoiding the abduction of your special day’s joy is the barrier your wedding planner creates. How? They know where the land minds, frustrations, and where the doldrums lie. So, it is a good idea to invest a bit much more on a wedding event coordinator. No, really, it’s about your return on investment and how it comes in more than just the savings a planner creates, but their ability to cover potholes of stress and prevent loosed opportunities. A wedding planner assists in several facets of your wedding event, consisting of negotiating with wedding vendors like for example the wedding officiant, DJ, floral needs, the cake, mapping out seating, creating awarding winning invitation ideas, the best photography, and much, much more. Sometimes, a wedding planner uses the relationships/network they have within the wedding industry to obtain better vendors. Plus, get you the best offers, and save you the money and time. The wedding event planner will want to do a detailed interview. Of course, they should insist on interviewing both the bride and groom together and individually. This allows them to prepare and outline what they’ll need to supply. If they are to provide both of you with the special day of your dreams. Then after a little collaborative activity, they will have a real understanding of what your vision is and what you’re trying to pull off to make your day perfect! A great wedding planner will have the ability to aid you in arranging, budgeting, and acquiring the perfect services for your wedding. Plus, their questions will help you extract ideas and concepts which expand and enhance your vision of the perfect day. In the agreement or frequently referred to as a letter of the contract, the wedding organizer will include the solutions that she or he is anticipated to carry out, the expense of these solutions and also the repayment terms. When you get the agreement, if there’s anything you do not agree with or anything you don’t desire, review it with your wedding planning coordinator prior to authorizing it. When you authorize the contract, you and the wedding planner need to be on the same page; and thus, you’ll both avoid any type of possible confrontation about what was agreed to latter. So, just how can you hire the perfect wedding planner? So you avoid a mediocre planner and event? First, you should go to friends, relatives, and neighbors to start your provider list. Then Google “wedding planners”, “wedding coordinator”, and lastly “event planners” and add those result to your list. Then do an online review search of each provider on your list. Once you’ve narrowed this down to one or two simply ask for client referrals you may call on. Of course, you’ll want to draft a list of questions which are important to your event. Use these questions to narrow your selection. What are the big advantages of working with a premier wedding planner? They pay for themselves by what they bring to the table, period. Also, of course, the other things mentioned previously like saving money, the power of their network relationships, avoidance of not potholes and stressors, and as a problem solver. In fact, the best planners will almost never have problems to solve because they know/recognize the potholes which create problems. Caution: You should make sure the wedding planner’s goal is to create the wedding of your dreams and don’t let them take the easy road by delivering a “cookie cutter” wedding. After all, you and your future mate are unique and deserve a creative, connected, and “about you” wedding planner. Remember, just take your time and hire the right wedding planner for your dream wedding. Just what is the cost of a wedding planner? Their fees range from 5% to as high as 20% of your overall wedding budget plan. However, the best wedding planners will be on the upper end of this scale. Here’s the big take away. If you have put your budget let’s say at the national average of $15,000 dollars. Then, you must recognize paying a wedding planner for $3,000 is a steal and can be easily justified (If they are a top tier vendor) by saving you from mistakes of your inexperience! You are no longer going it alone and now have the experience you need to win. We all shop for groceries (okay, well not all of us but most of us) and because we have a bucket load of experience in grocery shopping, we know when we are being taken advantage of. This all by itself can save you a wedding planner’s fee and we’ve just scratched the surface of their value. We must not forget our real goal is to pull off our special day and still be smiling and enjoying the day. While being able to say to ourselves, our wedding planner saved us money, stress, and provided warnings as to what we might want to avoid (potholes). Undoubtedly, it can be said the hiring of a five-star wedding planner is a worthwhile strategy. Rev. 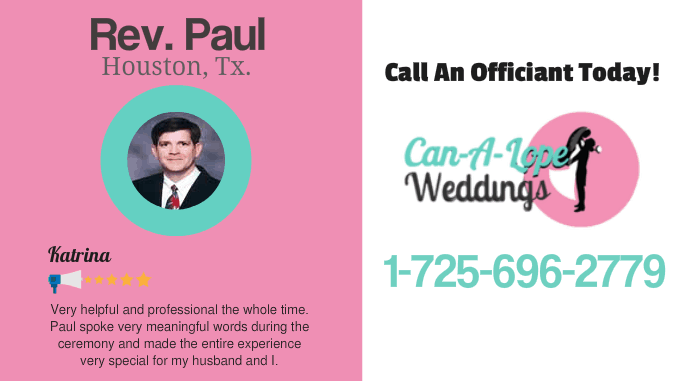 Paul | Wedding Officiant Houston TX.